Following on from the Berghaus trailtakeover, we headed south to meet up with some friends for a BBQ on Sunday. The weather was again perfect for anyone not Woking bank holiday weekend and it appeared that everyone had the same idea – unplanned BBQ, so predictably the shops were out of burgers. 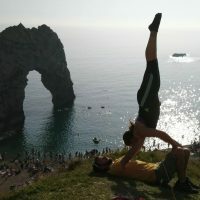 No problem for us, with some good advice from Gee, and me staying well out the way, homemade burgers were enjoyed all round, along with some acroyoga and indo boarding. The following day we all headed down the Portland where Gee and I set up a few top ropes at the cuttings for everyone to try outdoor climbing. Fueled by the BBQ leftovers we had a full on day teaching and supervising but nonetheless fun and rewarding. Having not quite filled the day, we drove east around the coast to the buzzing beaches of Durdledoor. We arrived late evening, thankfully seeing large numbers of people beginning to leave. It was great to chill on the beach (sea was a bit cold!) before heading back up the van and on to find some fish and chips.